Escondido residents may be excused if they don’t realize they can vote for Sheriff in the election next June. “Lots of people don’t know,” says Dave Myers, a commander in the Sheriff’s Dept. who is running against his boss, the three-time incumbent William Gore. Gore and Myers will be the only two candidates on the ballot next year for that position. People who live in cities assume that because they have a chief of police that the Sheriff doesn’t impact their lives. They couldn’t be more wrong. The Sheriff is in charge of many things, such as the crime lab, ASTREA and fire rescue that cities often call on to assist them. He runs the jails. This contest is an instance where there is MUCH more than a dime’s worth of difference between the incumbent and his challenger. Gore and Myers disagree strongly on one issue that is a paramount importance to gun rights advocates: the Sheriff’s longstanding policy against issuing concealed carry permits to most law-abiding citizens who ask for them. The Sheriff doesn’t want to, and his challenger says he will “follow the law,” which he insists Gore does not currently do. “I’m completely different than Sheriff’s Gore on that,” he says. “As Sheriff, I have the obligation to follow the law, not to push my subjective opinion against law-abiding citizens.” He criticizes Gore for having “wasted hundreds of thousands of dollars” defending his CCW policy against legal challenges. Myers notes that 1,500 CCWs (carry a concealed weapon) were issued in San Diego County last year, which is many, many fewer than most counties of this size, he says. Asked to speculate why the Sheriff is opposed to CCWs, Myers says, “Gore says we are an urban county with such a high density that we don’t need people running around with guns.” He adds that Gore probably gets that idea about “urban density” because his top support comes from La Jolla and Rancho Santa Fe. “Running against my boss has been interesting,” says Myers, who is happy that since he is a public employee he can’t just be demoted or fired for the “offense” of daring to challenge his superior in an election. He has, however, been forbidden to attend strategy meetings with the other seven Sheriff’s commanders and “he moved me into a broom closet for an office. He’s taken me out of the chain of command.” What’s ironic about that is the only person who IS legally qualified to run for Sheriff is a member of the department. Myers is a San Diego native who has spent the last 32 years of his 34 years in law enforcement in the Sheriff’s Department. 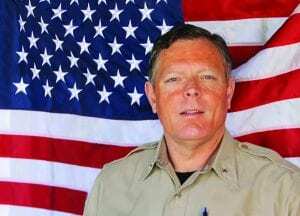 Myers is an unusual candidate to be running for Sheriff in the traditionally Republican and conservative San Diego County because he is a gay man—and a Democrat who believes that Gore’s policies are often anti-woman and anti-Gay. Despite that, he is getting a lot of support among second amendment advocates who don’t care about his party or his sexual identification. If elected, Myers would be the first gay man to be elected sheriff in the United States. “Right now, we have a huge trust gap between the community and the police,” that the current Sheriff has allowed to creep up on him and that he has resisted addressing, says Myers. Myers also says that there has been a lack of transparency on deaths and inmate violence in the jails. “There are strikingly few women and minorities on the force.” When people who might apply see how uniform the department’s make up is, they are discouraged from applying, he says. “We have a women’s jail, and by law we need women deputies to staff it.” So why not encourage women? Myers says he would avoid optics that might offend minorities, such as the Sheriff’s recent appearance with Attorney General Jeff Sessions in support of the Border Wall. Myers has urged policies that don’t force the homeless and mentally ill into the county jails. He notes that it costs $70,000 per inmate per year to house someone in the jail. That’s half of what it costs to provide housing for such people. Obviously, the Sheriff can’t change the laws, but he can advise the people who do change the laws, and he can adopt policies for when to book and when not to book the homeless. “We need to stand up and say that the jails should not be used for the homeless. No member of the Democratic party has been elected Sheriff in San Diego County for 60 years. Myers thinks the time may have come to change that since Democrats outnumber the GOP by 200,000 register voters. I really think you should take a close look at Meyers, find out what he has done at the Sheriff’s Department. I think you will find out that he has done very little if anything! Compare his training, experience, positive impact, qualifications, and the treatment of his employees and I believe that you will be astounded how much better a Sheriff Gore is and will continue to be!!! I’m a lifelong Republican and I’m voting for Myers becauise I want a Sheriff who foloows the law rather than interpereting it. Sorry but I think the County of San Diego’s motto is much more weighted fairly and just. Commander Myers will beome the first openly gay shérif in the US and as Shérif may just be the only one that has a habit of practicing Agage regularly in our counties leadership. Now that is the news story. I’m gay, he is gay…so what. Now understanding and practicing Agage on a regular basis…I hope he is a trend setter. Commander please contact me for I volunteering to make sure your are the New Sherrif in town.